What Are the CozyPhones Contour Series Made From? What Is the Sound Quality of the CozyPhones Contour Series? How Does It Feel to Wear the CozyPhones Contour Series All Night? Does CozyPhones Offer a Trial Period, Return Policy and Warranty? CozyPhones founder Paul Miller himself admits to using “another pair of headband headphones” in the past, because listening to audio books and podcasts helps him fall back asleep when he wakes up in the middle of the night. He eventually decided to make his own sleep headphones, as he was not satisfied with the status quo. CozyPhones were born out of desire to make sleep headphones more affordable and more comfortable. These days, CozyPhones has an expanded product line: sports headphones, wireless versions, and more aesthetic options. It is worth noting, though, that the company ventured into new territory with their children’s headband headphones. As we mentioned above, CozyPhones is now a whole product line! For the purposes of this review, though, we’ll be focusing on the newest version of the company’s sleep headphones: the CozyPhones Contour Series. This new product features a mesh inner lining. Its ergonomic design is great for sleep, meditation, relaxation, and yoga. The mesh and the contour shape, said to dip down over a sleeper’s ears, work together to help the headphones fit properly and stay in place. The main parts of the CozyPhones Contour Series are: headband, cable, speaker drivers, and audio jack. Headband. While the part that touches skin is mesh, the outer lining is soft and lightweight fleece. This most visible part comes in three colors: black, gray and violet. There is the small opening at the back of the headband for the cable to hang out. Cable. The plaint and braided cord that comes with CozyPhones is said to be sturdy enough to withstand normal sleep headphone use. CozyPhones customer support says that the length of the cable is 1.5 meters, but it’s listed as 52 inches on Amazon. Speaker drivers. 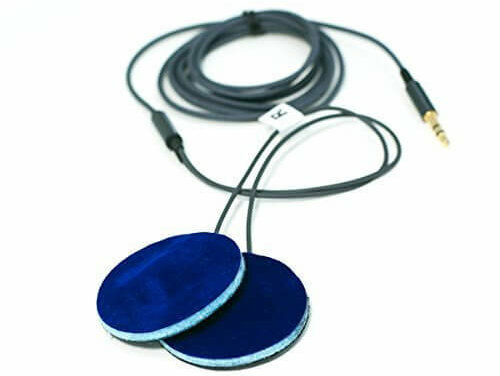 These thin and flat speakers covered with foam are found within the headband and are removable. They need to be, so you can wash the headband! The left and right earphones are marked, too, so you need to take note of how you re-position them after washing the headband. Audio jack. This part is also called a connector or a plug. The CozyPhones Contour Series uses the standard 3.5 mm size. Do the CozyPhones Contour Series Come with Accessories? No. This particular product of CozyPhones comes by itself in simple and clear plastic packaging. The way they’re packaged isn’t really shown on the official website or on Amazon. Upon further research, we came across photos of verified online purchases that show new CozyPhones in plastic packaging only. Want a travel pouch? You’ll have to find your own with the CozyPhones Contour Series. 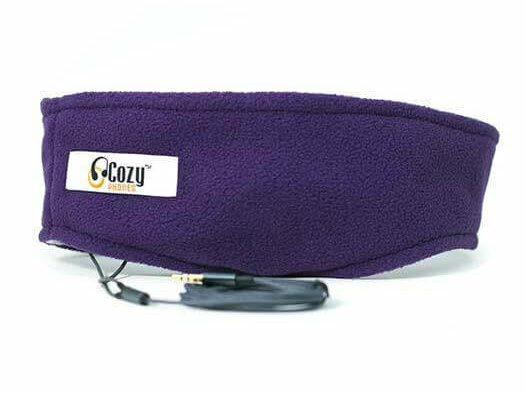 However, a pouch is actually included with original, all-fleece CozyPhones Sleep Headphones. Similar to other industry counterparts, the impedance of the CozyPhones Contour Series is 32 Ω and the frequency range is from 20Hz-20kHz. What does this tell us? With similar impedance and range, we can expect similar sound quality. 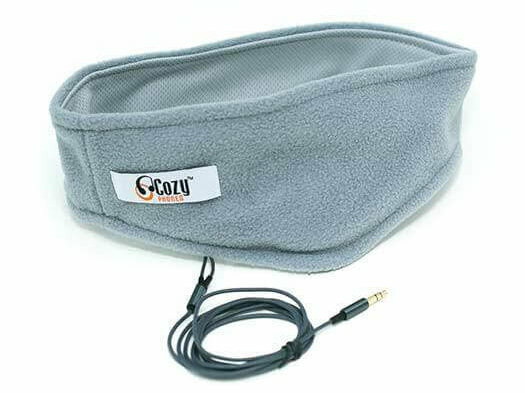 CozyPhones will do the job just as well as other sleep headphones on the market. Don’t expect noise cancellation, just passive noise blocking and isolation. Like other headband headphones, expect the volume to be a little quieter, too. The sound does need to go through fabric, after all. It’s in the name: CozyPhones are meant to provide a snug and comfortable fit. Sound quality isn’t the main focus here! That being said, the company is more vague than most when it comes to tech and audio specifications. First consideration: As we’ve mentioned, the CozyPhones Contour Series is just one out of several in the CozyPhones product line. 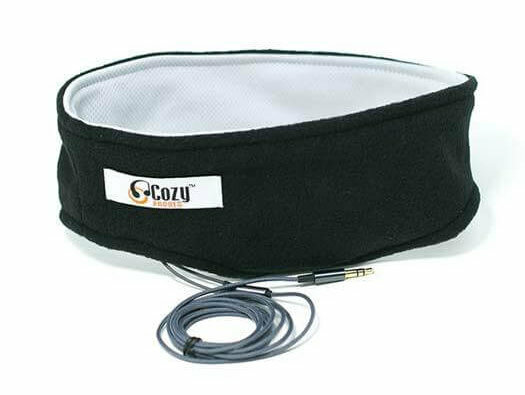 There are different kinds of CozyPhones in adult sizes: the original all-fleece version, the Contour Series, and Active Headband Headphones featuring mesh and Lycra. As of this writing, the children’s sizes seem to be wholly all-fleece. In terms of technology additions, there’s also a version that uses Bluetooth, for people that prefer to go wireless. There is no version with microphone compatibility, though. Are You Looking for Sleep Headphones for a Child? The CozyPhones line of children’s headband headphones seems to be the biggest success of the company so far. While they are attractive and popular, discussing in detail really does not have a place in this review. However, if you have or know a child that may benefit from sleep headphones, CozyPhones may be your best bet. These products come in fun animal-based designs and help children and their parents not only when it comes to sleep hygiene, but also when it comes to managing special needs. These smaller headband headphones fit snugly, and can be used by active children reading or playing games on their devices without earphones falling out. Are You Looking for Sleep Headphones with Replaceable Parts? CozyPhones, unlike AcousticSheep and other brands, does not offer replacement parts as of this writing. We saw no extra headphone systems or headbands in their online store. This feels to us like a vast oversight, as sleep headphones suffer from nightly wear and tear. Headbands also need to be washed regularly to ensure good hygiene. More than anything we’ve mentioned so far, it’s this omission from their product line that has us veering more towards a negative conclusion. Even if you find CozyPhones a perfect fit, enough to make wearing them to sleep a lifelong habit, it doesn’t make sense to keep on buying the whole product if all you need is one spare part. It wouldn’t be efficient, and it would be less affordable in the long run. Switching to a brand that might have a slightly higher price point, but offers replacements, would be a better option. Are the CozyPhones Contour Series Easy to Use? CozyPhones Contour Series are designed to fit comfortably and snugly over the ears, so using them should be a breeze. Just plug the headphones into a media player or your smart phone, place the connected device somewhere secure and wait for yourself to drift off. 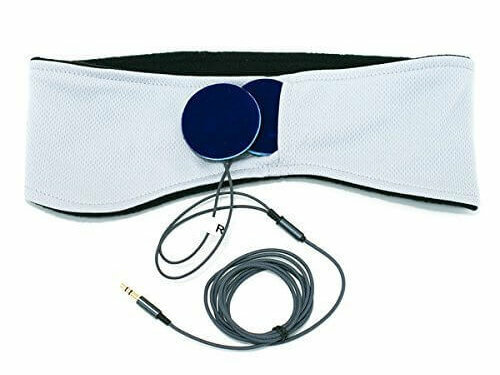 If you absolutely need to wear headphones while you sleep, headband headphones are probably one of the more comfortable options around. The speakers of the headphone system are less than an eight of an inch in thickness and padded in form. They’re also just slightly larger than a quarter in width. Tucked into the mesh and fleece headband, it’s almost impossible to feel them or tell where they are. Back and stomach sleepers may not even notice them until sound is playing. Side sleepers will often find them more comfortable than any other kind of sleep headphones. Some reviews do say that side sleeping may still result in a little bit of tenderness in one ear, but you body will get used to it after a while. Do you sleep hot or sweat a lot? 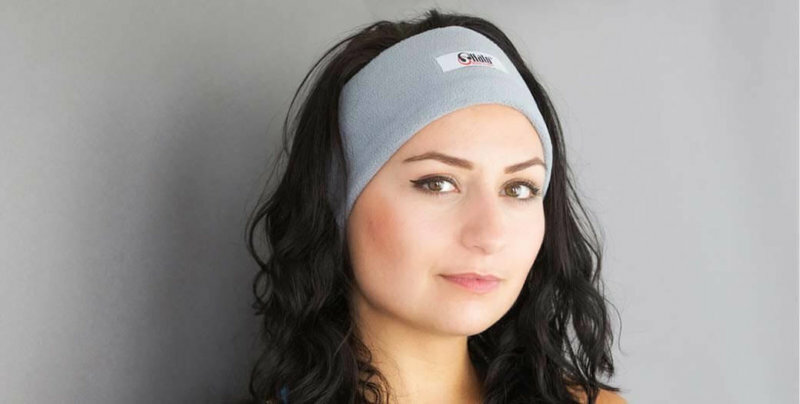 You may want an alternative to the fleece headband, lightweight or not. Instead of the CozyPhones Contour Series, you can check out CozyPhones Active Headband Headphones, which uses lycra instead of fleece. We normally review products based on their own merit, but with the almost identical design of CozyPhones and AcousticSheep, we can’t help but make direct comparisons. After all, at the end of the day we are in the business of figuring out what our favorites are, and which ones we would recommend more. Which Is Better: CozyPhones or AcousticSheep? It depends! If we’re to look at innovations made, AcousticSheep is ahead with its induction charging option and the inclusion of a microphone—not to mention offering replacement parts. However, CozyPhones is better than AcousticSheep when it comes to attractive designs for children. AcousticSheep SleepPhones seem to be very much focused on helping people sleep, as well as help with sufferers of tinnitus. CozyPhones can conceivably compete in the same field, but the focus on their Kids Headband Headphones has made them popular with a different community with different needs. The potential of CozyPhones to bank on this niche they have carved for themselves is great—and we’re hoping this translates to better CozyPhones options for adults. How Is CozyPhones’ Customer Support? CozyPhones has a well-maintained official website with a great Support/FAQ section. They’re active on social media and also very responsive on Amazon, which is a definite plus. Having said that, it’s a little bit disappointing to note that there is really only one way to contact their customer support: email. No live chat, no telephone hotline. There is no advertised “sleep trial”, but there is a 30-day 100% money back guarantee and a warranty period. To return a pair of CozyPhones, the company states that the item must be in the same condition it was when it was received, unused and in the original packaging. It also requires a proof of purchase or a receipt. Defective or damaged items that were in this condition when received are also eligible for return or exchange. CozyPhones come with a limited warranty that only applies to defects in material or problems with workmanship. Your item may be repaired or replaced. While the coverage is standard—most sleep headphones have a similarly stringent warranty—the time period is way below average, lasting only 180 days. Many competitors offer a one-year warranty period. How Much Do the CozyPhones Contour Series Cost? As of this writing: CozyPhones Contour Series are $21.97 on the company’s official website. They’re slightly cheaper on Amazon. They are definitely on the more affordable side, compared to other sleep headphones—while still being a company that is based in the US. Yes, there are cheaper options, but most that go below CozyPhones’ price point are of questionable origins and quality. Visit Amazon & Find CozyPhones Contour Series Deals Now! A affordable as they are, we would not wholeheartedly recommend CozyPhones Contour Series over headband headphones made by more established brands. However, if CozyPhones were to add replacement parts to its online store, it would be a game changer—even with the shorter warranty period they offer. Sleep headphones like these aren’t designed to last forever, so warranties and guarantees can only go so far. The power to manage the maintenance of the product yourself is much more important. Also, we admit that the children’s headband headphones are very fun and attractive—we’d buy them for ourselves if they only came in adult sizes! Looking forward to the future and wishing for more improvements from CozyPhones. This may not be our top recommendation, but they are certainly a brand to watch.